Time to sell your Spyglass condo? Read about today's resort-market condo buyer. 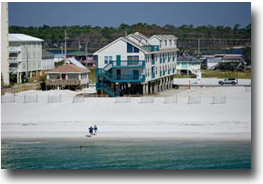 Spyglass condo development is one of the smaller complexes in Gulf Shores, Alabama. It is located about 1.5 miles west of Highway 59. This two-story, wood-frame building was built in 1984 and offers a more intimate setting than the hustle and bustle of the high-rise towers. Even its location further west of the "T" provides a quieter setting for its owners and guests. The complex consists of two-bedroom/two-bathroom (900 sq. ft.) units that have side or indirect views of the Gulf of Mexico from both the front and back of the units. The complex is situated directly on the beach. The amenities include an outdoor pool, BBQ area, and covered parking. Please let us know if you would like further info for Spyglass or any other condos, homes, or real estate along the Gulf Coast or would like to schedule a private viewing by emailing info@condoinvestment.com or by calling (251) Area-Pro (251-273-2776) for immediate assistance. Read these RENTAL TIPS to maximize rental revenue at your Spyglass condo. Annual rental income for Spyglass and all other Gulf Shores condos using our Alabama Gulf Coast Condo Revenues page.